"Quest for a Legend" is a real quest, a global search for the historic LOUIS XIII decanters which might be hidden in your very own cellar. In the celebration of LOUIS XIII cognac’s 140th anniversary, the House of Rémy Martin is in a quest to trace the treasure hidden by time. Commencing on February 3, 2015, now the quest is on for the rarest LOUIS XIII decanter in Singapore, Malaysia, India and the Philippines. 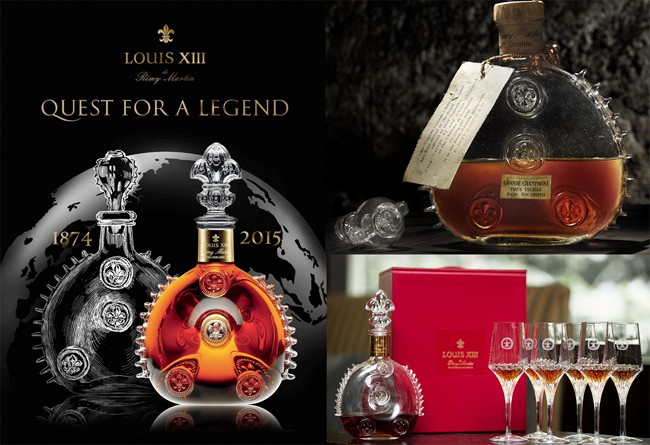 LOUIS XIII legend started in 1874 when it was first crafted by the master. For the first time in 1876, the first few bottles of the exquisite cognac traveled across the borders of Europe into the new world. It had first reached United States and then set sailed further until in 1881, it finally reached Asia and on its journey continued into the other parts of the globe. Few lips in various area of the globe had been fortunate to taste the firsts LOUIS XIII cognac and the decanters are now hidden somewhere, maybe as part of your collection, as a family heirloom, or just sitting in your shelf. The bottles are exquisite, fit for the LOUIS XIII cognac, and now each one has its own story to tell. Those who believe to have the bottle in their possession are encouraged to send its photo and details of the decanter to the local Rémy Martin office or via Whatsapp for a chance to win a visit in France. You can also join by sending your applications here. LOUIS XIII is a signature cognac proudly made by the House of Rémy Martin. Since its establishment in 1724, the House of Rémy Martin had been consisted of the best cellar masters that had developed mastery of 1,200 eaux-de-vie unique blend of Grand Champagne aging from 40 to 100 years. Crafted in 1874, LOUIS XIII had been an ambassador of French art-de-vivre, witnessing and being part of history all over the world for centuries. This post has been sponsored by Remy, but all the thought are owned by CEnterTechNews.